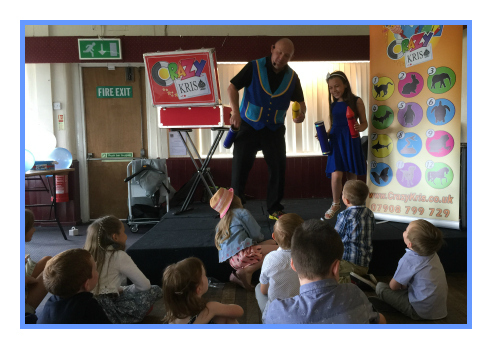 Crazy Kris is the Kids Magician Warrington want! Kris gives FREE invitations and performed at hundreds of parities each year. Each child recieves a balloon model to take home with them which makes a great addition to the party bags. This silver package is crazy Kris’ none stop 45 minutes of comedy crazy magic show.Then Kris will create balloons right in front of them while he has music played on in the back ground. This package consists of magic and balloon modeling. This will have the children astonished and rolling around with joy and laughter. If you are hosting a larger event Crazy Kris will arrive with his own PA system, so you and everyone will be able to hear clearly what’s going on with the crazy antics! Kris will make sure the birthday child is the star of the show! Crazy Kris is the Kids Magician Warrington want. 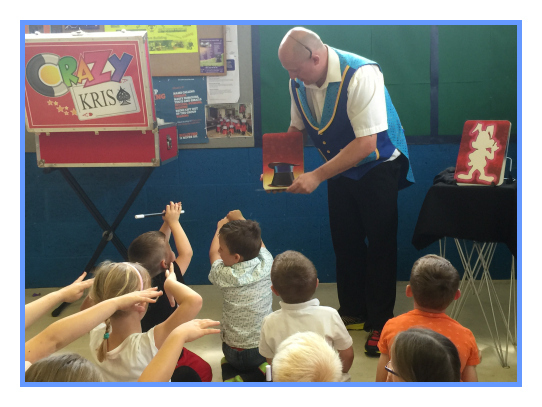 Crazy Kris' Magic show is fully interactive-(they don’t just sit there and watch they get to join in). All Kris' well behaved helpers get a certificate and a badge for helping him out completely free. The birthday child becomes the star of the show and is picked to help me out with a special routine. The birthday child receives a special birthday prize. Each child gets a balloon to take home with them.